His mother’s eyes were tearful as she read the letter out loud to her child: Your son is a genius. This school is too small for him and doesn’t have enough good teachers for training him. Please teach him yourself. After many, many years, after Edison’s mother died and he was now one of the greatest inventors of the century, one day he was looking through old family things. Suddenly he saw a folded paper in the corner of a drawer in a desk. He took it and opened it up. On the paper was written: Your son is addled [mentally ill]. We won’t let him come to school any more. True story. What does this have to do with Christmas? Christmas is a time that we give gifts and we remember the gift of Jesus to the world. To me Thomas Edison’s mother is like Jesus, and his teacher like the devil. No pun intended (only because it’s not funny). The devil wants us to think of ourselves as unworthy, un-usable, un-wanted, and all of those other ugly “uns”. But there is our parent, Father God, who tells us just the opposite. You see, like Edison’s mother, God see’s our potential! What a lovely gift. Edison was a genius. He invented so many things that helped others, many that we still depend on today. The gift his mother gave that one little boy, ended up being a gift to the whole world. We have to think about this. If we choose not to believe God’s version of who we are, we are stopping the gift from flowing. No telling how many people will be affected. His love, His approval, His opinion is all that matters. Everything else is just irrelevant. Mrs. Edison recognized the importance of what we say to our children. She chose to only encourage and love. 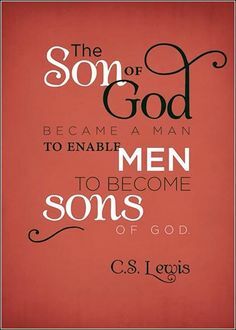 That is our Daddy God.